The sale of Mayan Bolas supports a vital Cottage Industry and helps Faith Harvest Helpers raise funds for our domestic and global outreach & relief programs. Each bola has the interview of the creator attached to the unique, handmade, colorful, glass beaded ornament. Bolas are sold throughout the year at a variety of Northwest fairs and bazaars, are consigned to various retailers, and can be consigned to organizations for fundraising. For more information on events and consignment please contact the YWAMFHH office via email: contact@faithharvesthelpers.org or by phone (360) 339-4726. 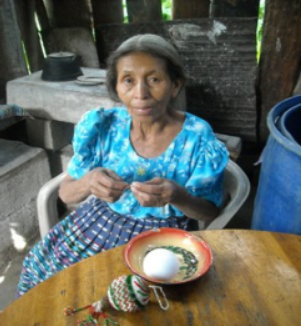 The Mayan Bola Cottage Ministry helps support families in Guatemala. 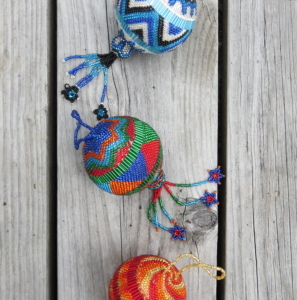 These exquisite works of art are hand- made by Mayans in the Lake Atitlan region. Families are struggling to live 5000-7000 feet high in the volcanic, Western Guatemalan Mountains, some in homes made of corn stalks. Life there is very desperate with few jobs. The women are widowed, married to men who are unemployed or underemployed, and families whose father has left and not returned. Thank you for helping them to help themselves when you take home a unique piece of art! If you are interested in purchasing one of these beautiful bolos, click the DONATE ONLINE page after you send an email with your item request. Please include all your contact information. Email YWAMFHH office via: contact@faithharvesthelpers.org or by phone (360) 339-4726. Bolos are $20.00 each. Shipping is an additional $7.50.